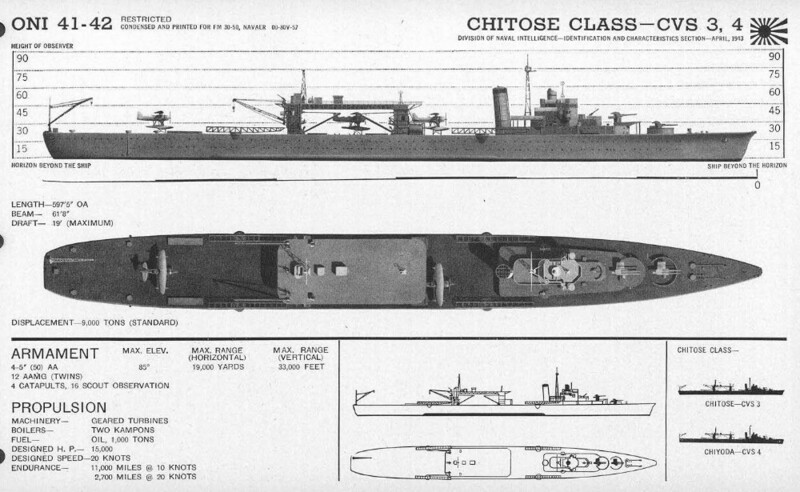 Dimensions 603'5" by 61'8" by 23'8"
Dimensions 631'7" by 68'3" by 24'8"
The Chitoses were completed in 1938 as the first Japanese seaplane carriers built as such from the keel up. By the time of the Pacific War, they also carried midget submarines, which they could launch from two large steel doors in the stern. They had been designed as part of the "shadow fleet" of vessels that could be rapidly converted to oilers, submarine tenders, or light aircraft carriers should war break out, in an attempt to get around the limits imposed by naval disarmament treaties. Among their unusual features was mixed propulsion, with diesel for economy and geared turbines for higher speed. 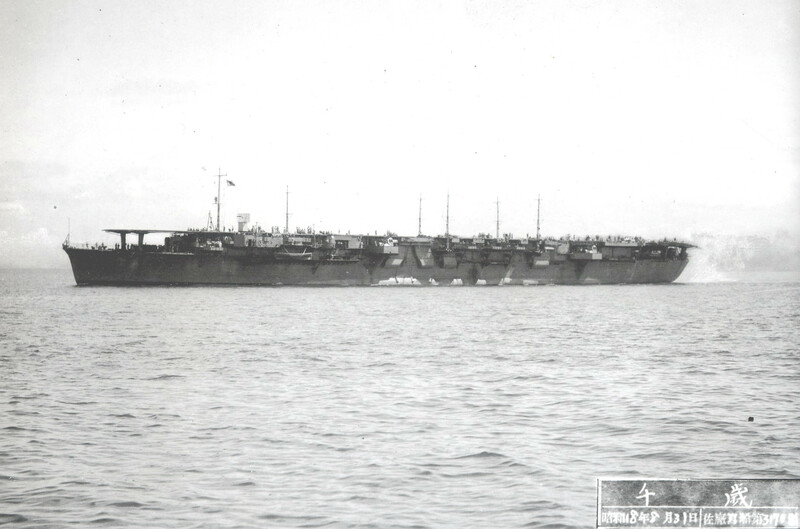 The ships also had an unusual profile, with a very large seaplane handling area aft, a service area amidships which was covered by a large platform, and the bridge superstructure well forward. 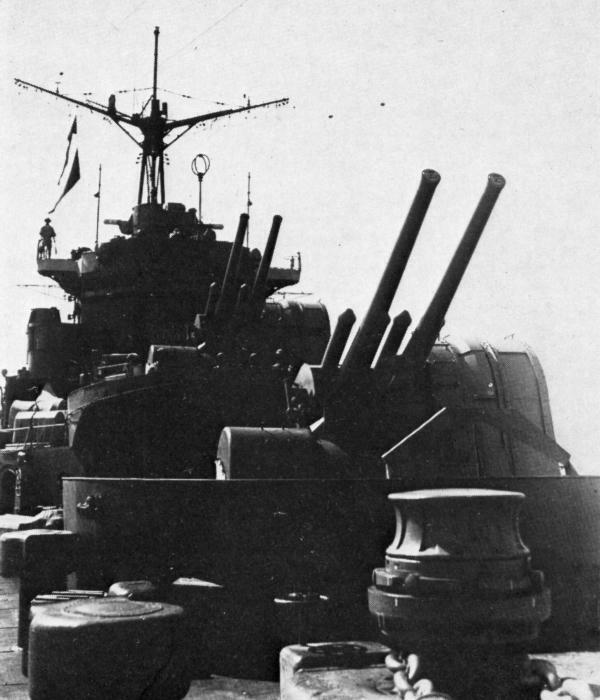 The Chitoses were taken in hand for conversion in 1942-1944 to light carriers. The service area platform and associated machinery was removed, the bridge superstructure cut down, and the main deck converted to a hangar deck, over which a flush flight deck was constructed. They were not particularly successful, in part because there were few carrier-qualified pilots left by 1944 to fly off of them.